Weddings are often very similar and very boring, at least for anyone not in the immediate family of the bride or groom. That’s why so many people drink at weddings to spice things up a bit. Well if your not a fan of drinking like me, you’ll likely need some other way to make your wedding exciting, and what better way to do this than to involve Zelda. Our friends over at Kotaku posted pictures from a reader’s wedding, including Zelda themed cufflinks and even a Zelda themed wedding cake. If you can find a wife who will put up with this at her wedding, you know you found the right person. Congratulations to Kyle and Ashley. 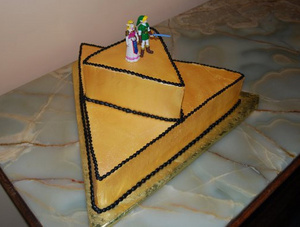 We look forward to seeing pictures of your Zelda themed 50th Anniversary Party.